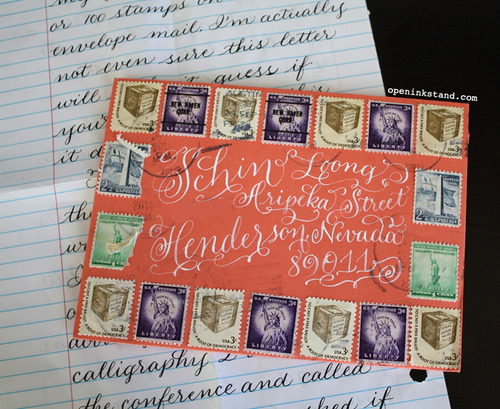 Time for another round of Monday envelopes from my dear penpals! 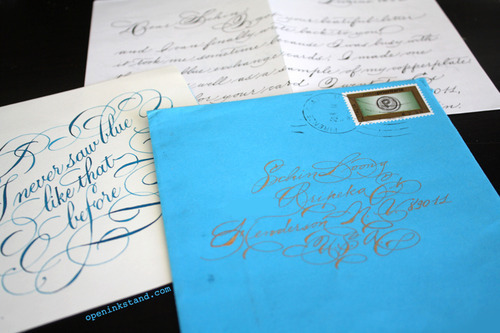 It’s been quite an awesome month for letters, check it out! It was hard taking a photo of this one, as Margherita used a shining gold on blue, the effect is beautiful! I can’t help but keep twirling the envelope in my hands to see it shine. The stamp is in the same gold too! This hilarious one is from Brittany F., and it is a kind of Annoy Schin’s Postman, LOL! She didn’t think it would arrive, but it did! I can’t imagine how much work she had to put into figuring out the stamp value and placements… she must be good with math! This classy one is from Felicia in Singapore. Just look at how she wrote my name, I want to steal it and use it for my business cards now. Can I, Felicia? Lol! Thanks for your letters! Keep em coming. 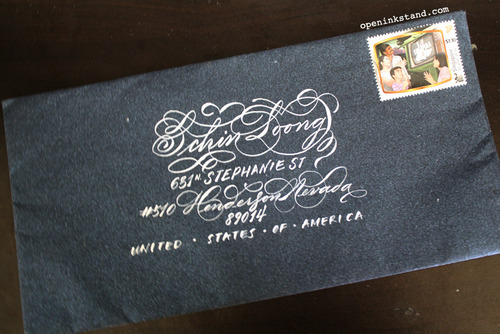 All of that lettering is beautiful! I have to admit I’m a little bit envious. Haha thank you! You make some lovely mail too.